Here the Wales Coast Path runs through a Second World War minefield, with craters from exploded mines clearly visible. There’s no need to worry about treading on an unexploded mine – the whole site was made safe once the threat of invasion had passed. 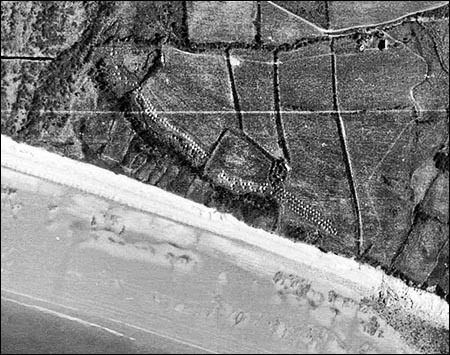 The aerial view on the right was taken by the RAF soon after the war, and is shown here thanks to the Welsh Government and Dyfed Archaeological Trust. The mine craters are clearly visible in the centre. They have become more overgrown in the decades since. The broad sweep of Marros Sands would have provided an ideal landing place for German troops. The coast south of here would have been their natural route off the beach, avoiding steep slopes or cliffs and a narrow access point which could easily be defended. From here, the troops would have attempted to follow a track which leads northwards to Garness Farm. This probably explains why so many mines were clustered into a strip c.300 to 400 metres long here. Had the invaders gained a foothold in West Wales, they would have faced another challenge. Britain would have cut off the occupied area to the west of a “stop line” between Carmarthen and Cardigan. Natural geography and constructed defences along the line would have helped Allied troops to contain the German army.